At our Demo Day, the winning three teams will present their solutions and the progress they've made since the hackathon! At least 80 percent of the legal needs of the poor and two-thirds of the legal needs of middle income Americans are not met. 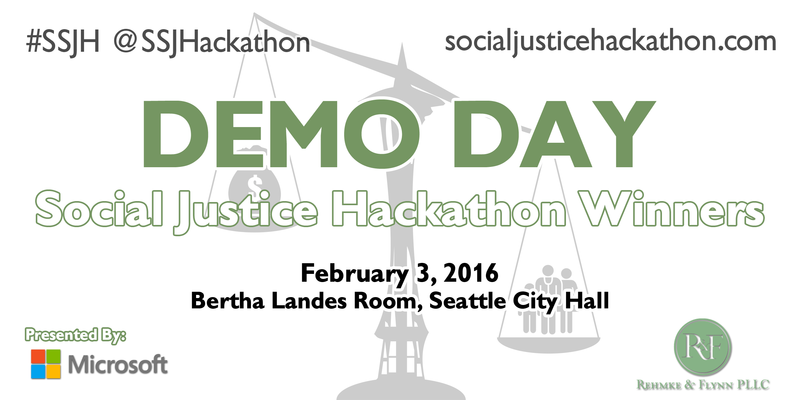 Seattle University's Social Justice Hackathon will unite the legal and tech communities to create innovative solutions to American access to justice. We're looking for projects that seek to eliminate the gap between those who need civil legal services and those who provide legal resources. Participants include developers, designers, lawyers, law students, business developers, "idea people", or anything in-between! Teams can work on a project of their own interest or select from any number of problems suggested by our community partners. Ideas of all sorts are accepted, from Web and Mobile Apps to Wearables and Algorithms. Fill Out Survey and Get Free Ticket! Developing educational platforms to empower and inform citizens of their legal issues, and legal actions that they may independently pursue. Legal portals that use an automated triage process to direct people needing legal help to the most appropriate form of assistance and that guide them through the legal process. Mobile technologies that reach more people more effectively and the application of business process/analysis to legal activities to streamline interactions and improve efficiency. Document-assembly applications that support the creation of legal documents by service providers and by litigants themselves. Congratulations to Court Whisperer, Social Justice League, and Paid It for winning the Social Justice Hackathon! Don't forget to join us for our Demo Day in February! Our community uses Slack to communicate and innovate together! Stay up to date before and during the event using the #SSJH hashtag! Enjoy dinner, network, share ideas & socialize amongst attendees. Hon. Donald J Horowitz "Fundamental Values, Technology and Justice System Redesign"
Continue hacking on projects and schedule session to meet with mentors to get assistance on projects. ﻿Sponsor Remarks then Hackathon teams present their social justice solutions. Donald Horowitz received his L.L.B. from Yale Law School, was a law clerk for a Justice of the Washington State Supreme Court. He has been a Senior Assistant Attorney General, the first Chief Counsel for the State Department of Social and Health Services. He is a former King County Superior Court Judge. He is on the Senior Advisory Board of the University of Washington Information School. In 2010 Donald Horowitz was awarded the highest honor of the Washington State Bar Association, its Award of Merit. He has recently been awarded the 2016 Charles A. Goldmark Distinguished Service Award, the highest award in Washington State for service to enhance the quality and equality of justice for all. Marty Smith is a Founding Director of MetaJure, Inc., a legal technology company. Marty practiced for 25 years with the law firm of Preston Gates & Ellis (now KL Gates), retiring from Preston in December of 2006. Marty is included in The Best Lawyers in America, International Who’s Who of E-Commerce Lawyers and Washington Law & Politics Super Lawyers. Marty is also the recipient of the 2007 Sharon Nelson Leadership Award from the Shidler Center for Law, Commerce and Technology at the University of Washington. Marty was the Chair of Washington State Governor Gary Locke’s Digital Education Task Force and the Chair of the Washington Digital Learning Commons. Milan Markovic is an Associate Professor of Law at the Texas A&M University School of Law, where he teaches professional responsibility, business associations, and international business transactions. Professor Markovic's recent research has focused on lawyers’ involvement in the financial crisis and the causes of lack of access to justice. He is also the principal investigator of the Texas Lawyers Study, which examines the incomes and career satisfaction of members of the state bar of texas. Professor Markovic’s scholarship has appeared in such publications as the Georgetown Journal of Legal Ethics, Texas International Law Journal, and Utah Law Review. Prior to joining the academy, Professor Markovic practiced law with Sidley Austin LLP and Baker Hostetler LLP in New York City and clerked for the International Criminal Court in The Hague, Netherlands. Brain is the CEO of Impact HUB Seattle. Brian has devoted his career to bringing people together to turn ideas into reality and to encourage entrepreneurship that benefits the community. Attorney at times (Vox Legal; Apex Law Group)-professor at times-partner at VentureScale.co-EIR at UW. Brian is also a proud alum of Seattle Univeristy School of Law. Professor Covington joined the UW law school faculty in 2003 as an Assistant Professor and Director of the Technology Law and Public Policy Clinic. Prior to his selection as clinic director, Professor Covington was a principal at the North Star Group consulting firm where he worked with municipalities on land use legislation, infrastructure development, and taxation policies applicable to high tech businesses. Ten years of service with McCaw Cellular Communications (now Cingular) and previous work as regulatory counsel for Group W Cable (now Comcast) provided him with a wealth of in-depth experience in the field of telecommunications law and policy. Aurora is the Director of CLS. She received her undergraduate and law degrees from the University of Washington. She began as an intern in 1995 with the Refugee Clinic of Evergreen Legal Services, CLS's predecessor organization. Since joining CLS, she has served as a National Equal Justice Works Fellow focused on housing and expanded leadership development efforts and access to justice issues.